The Honda S2000 was a fantastically well built roadster with a high revving inline-4 that was sold from 1999 through 2009. In the decade of production just over 110,000 units were assembled for world wide consumption, with 66,000 heading to the USA. 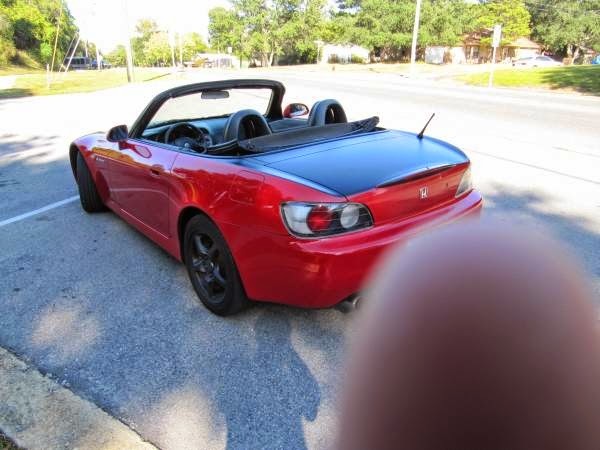 In the aftermath of the 2008 Carpocalypse, Honda scrapped the intended successor, but don't fret, because you can pickup a used S2000 for peanuts. 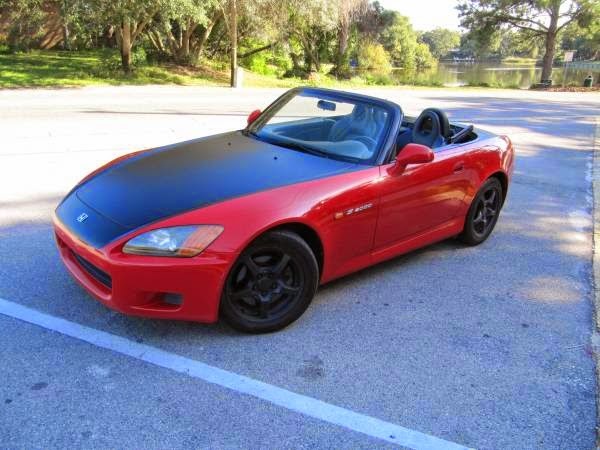 Find this 2000 Honda S2000 offered for $7,455 in Destin, FL here on craigslist. Tip from Randall. If you've never been behind the wheel of an S2000, you really owe it to yourself to give one a try. Head by your local Honda dealer or Carmax and enjoy a test drive in a used example of what was Honda's greatest product ever. Build quality is great, the engine (while lacking in the grunt of a big displacement or turbo mill) is second to only exotics in terms of high end scream, and the shifter is buttery smooth...or at least that is what the magazine pundits say...personally, I've never shifted butter, so I'd just say it is the nicest gearbox lever in the business that makes a satisfying snick-snick sound when you change gears. The Mustang/Camaro crowd will ridicule the S2000 for its meager 240 horsepower and 153 ft-lbs of torque output, but the AP1's 2.0 liter F20C is a power-per-cubic-inch freak that revvs all the way to 9200 rpm fuel cutoff in search of air. Gearing is surprisingly tall and you'll be doing something like 44mph in first and 67 mph in second before a flashing digital dash and harsh fuel cut reminds you to shift. You'll be hard pressed to find an SCCA autocross event that requires a 3rd gear shift, but you'll need to figure out full use of first gear to maximize performance. It is a hard car to drive fast, but very rewarding if/when you get it right. This particular example has some nasty flat-black paint applied to the hood/trunk that bleeds onto the fenders, so you'll need to do more than just re-source or re-spray then hood/trunk. The stock 16 inch wheels (that's right, Honda figured out that you don't need dubs to make a car handle and 16-inch wheels save weight and do fine in the turns) have been painted flat black as well...earning this car the coveted flat brimmer badge. These are still overpriced, considering you can buy a Porsche Boxster for the same. The Porsche is also a better looking car and more exclusive. However these are a nice upgrade from a Miata. I echo DT's comment that these are hard work to drive fast (and are not all that satisfying to drive slowly). Peaky high-revving engines sound neat on paper but in the real world, give me something with some low-down grunt. On the plus side, if you are going to be obliged to row the shifter, this is a great one to row. Okay, I'll play devil's advocate here. I disagree with TGM and Bobinott, in that these cars are far better to own than a Boxster in many ways, specifically in the ownership and maintenance costs. As noted, the driving experience is quite different. In fact, they're such different animals to drive, I can't imagine cross-shopping them. For folks that are into JDM and the like, this is heaven on wheels. For those that like a distinctly Porsche experience (a la 914), then the choice is obvious. Both are awesome and both are so very different. As the owner of a 951 and a MX-5 with a JR M45, I'm not necessarily an expert and this, of course, is just my opinion. I've driven the Boxster (I didn't particularly like it) and the S2000 (I loved it). I took one look at the engine access on both and, uh...yeah. Parts costs are night and day and zinging the RPMs on the Honda was addictive fun, while the Boxster is so accomplished that it was frustrating on city streets. I could feel the car getting depressed because it couldn't stretch its' legs and explore the polar moment. Or maybe that was just my bad driving. But in this case, I think cheerful and fun beats out serious and somber. It's hard to make out from the photos, but I see no evidence that the "nasty flat-black paint" isn't actually just a wrap. The picture of the top indicates that the black paint or vinyl was not there at one point. 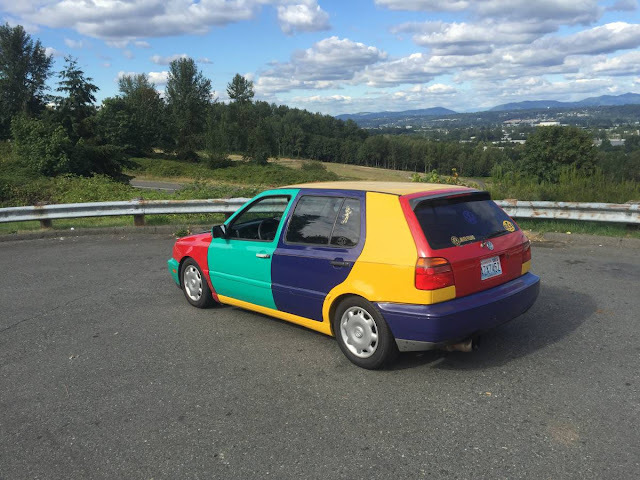 Obviously, it wasn't there from the factory and the owner added it, but it could be that it was added for the look of it and is easily removed. It might have been worth contacting the owner about it before declaring it to be that way. @K2 Mystery Car - I am no fan of the Boxster either. I helped a buddy recover his from the dealership at which he had abandoned it when it tried to commit suicide. The drive home was about 400km, so I got a pretty good feel for the car. It did nothing for me. I imagine there is some magic up at some very high limits, but in everyday spirited driving, I just found it harsh and "hunty". In the case of his car, the crankcase breather had messed up, and the engine had happily pumped out all its oil while driving. By chance, he stopped for lunch just about the time the oil ran out. The dealership told him he had been only a few km from a trashed engine, which likely would have run him about $25K. So, remind me again why I want to drive an exotic, whose limits I may never be able to probe? And between an S2000 and a good Miata, for me it would not be an easy choice. Overall flexibility vs that sweet song when pushed. So, I appreciated hearing your reflections. Thanks for your reply, Bobinott! I'd agree with you on the S versus Miata debate...that's a tough one. And it seems to me that the Mazda is such a blank page in that it can be customized in so many ways, while the Honda is what it is. Different strokes for different folks, but a much closer one than Boxster versus S2000, I think. 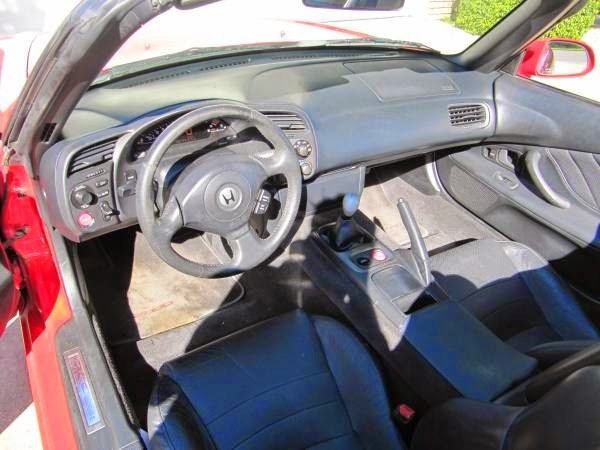 Another car that should/could be thrown into that mix is that last MR2. The kicker with that one seems to me the lack of any storage and less performance potential. Though, I'm sure there are plenty of 3rd gen MR2 owners out there that have figured out how to deal with both (NOS and no passenger, perhaps). K2, it does appear to have the flat finish of Plasti Dip. As for the Boxster, two words: Access panels. 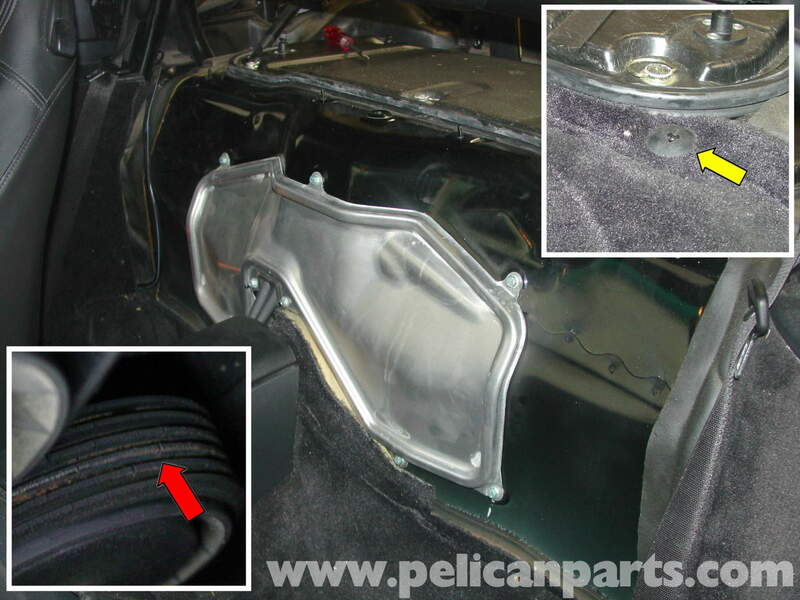 It ain't lifting a hood, but removing one patch of carpet affords more belt access than most other cars. Reminds me of my ancient Previa. Sometimes the access ends up being not that bad. Still, you lift the hood of the S2000 and you can at least see most everything. Again, I'm not knocking the Boxster. It's fantastic. But I personally believe the relatively high asking prices and retained value of the Honda is justified. It seems to me the same as the Mark IV Supra. Thes are such interesting cars that I would love to try one before buying it. I actually owned a Honda S600 a long time ago and loved it, much more fun to drive than my MG midget of similar vintage. Although I hated tuning the 4 carbs every time the weather changed. This one seems pretty sorted to me and wish it was closer for me to takea look. I now have and love my Porsche 924S SE wich is nice but totally different. Being a car guy I like to see and keep tabs on my engine, which is difficult with the Porsche Boxter and have never been attracted to it. This car frustrates me.....it could be the greatest automotive creation in the history of the ultraverse, but it's always been a moot point since my 6'3" frame has to be folded like origami to fit in it, and I have to put my size 13 shoes in the trunk and drive sock-footed, lest every stab at the accelerator or brake end up being an unintentional heel-toe maneuver. I think this is one of the last Japanese cars sold in the US that clearly wasn't designed around western dimensions. Although ours is very low mileage, fluids / filters and a battery have been our only expenses. Not so for my friend with a 2005 Boxster S. It too is a very rewarding car to drive, but the ownership costs are markedly higher than the S2000. If my wife was not in need of a car with greater hauling capacity, we would likely own it for another seven years. Great car, but I can see why it is not for the masses.